I can’t explain the sense of awe we had on rising up over the escarpment and seeing Lake Tanganyika stretched out in front of us. This lake is rather special. Formed in the fissure of the Great Rift Valley, at 673kms long, Lake Tanganyika is the longest freshwater lake, the second deepest and the second largest by volume, in the world. At over 13 million years old, it’s also one of the oldest. Across it’s waters lies the forbidden DRC. 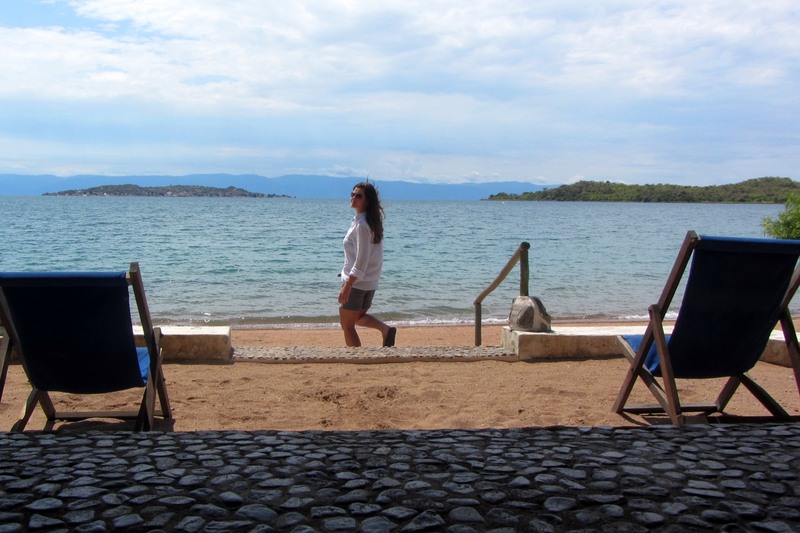 We were headed for Lakeshore Lodge, near Kipili on the eastern shores of the Lake Tanganyika. Lesanne had been in touch with the South African owners, Chris and Louise Horsfall, to arrange a photo shoot for her photographic book on Africa. Chris and Louise had very kindly agreed to have me stay with Lesanne. We came off the main road to Sumbawanga and down the escarpment track to the small fishing village of Kipili. The road narrows and just about disappears as you creep slowly past village huts and you are greeted by singing and dancing children along the way. There isn’t much room between the lake and the village and, at times, you’re driving over front lawns and under their fruit trees. This Lakeshore place sure was off the beaten track! A huge sign, the length of the entrance wall greets you as you drive into the grounds… “Welcome to Lakeshore Lodge. Arrive as guests, leave as friends.” Never a more true phrase spoken. 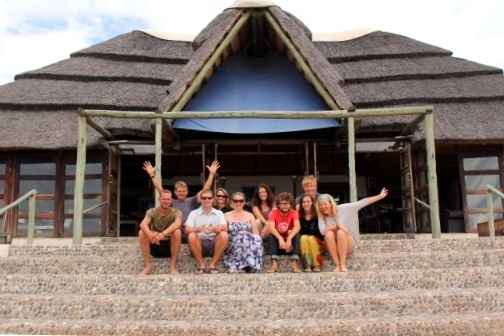 The owners, Chris and Louise Horsfall originally from Joburg, had arrived in 2007 and built Lakeshore Lodge in this remote part of Tanzania. It’s exclusive, it’s a hidden gem and is so worth the visit – honeymooners, this is the place for you! Overlanders, you have to come well off the beaten track to get here but it’s so worth it. 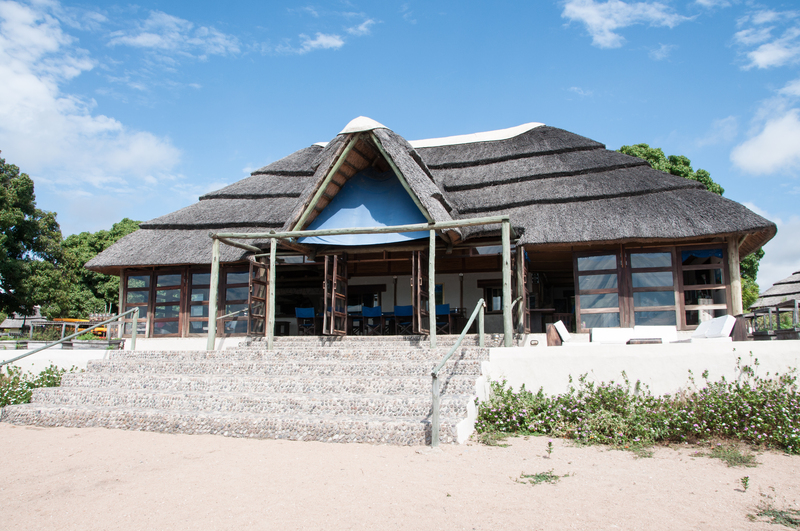 The lodge has a range of luxury chalets on water’s edge, stylish bandas and a campsite under their mango trees. The heart of Lakeshore Lodge lies in it’s amazing lounge, restaurant and bar area where we spent the next few days hanging out with these amazing people. Lesanne and I couldn’t believe our luck – we’d been treated to superbly stylish and luxurious chalet – the lake lapping the shore metres from the steps. The whole side of the chalet opens up to the water and before anything else, we took off our flip flops and went straight into the lake – the waters are crystal clear and the visibility is incredible. With only eight or so rooms available here, you’re bound to get to know the other guests – and I’m so glad we did. Louise’s brother Dave and his lovely wife Cath were over from South Africa to stay for six weeks. There were Nod and Emily, a couple from the UK. Nod was doing research on the slave trade in East Africa – super interesting to talk to. The last two guests were quite special. Mat, a Kiwi now living in Scotland, and Jaap, a Dutchie now living in Switzerland, were on their own overlanding adventure down from Europe to South Africa on their KTMs. They got in contact through mutual friends and met up for the first time in September in Genoa on their way down. They had also heard whispers of this magical place and had come down the length of the lake from Burundi. Having hung up their riding boots for a few days, they too were enjoying the respite from travelling. Jaap is a camera man by trade had the most incredible footage of their journey – all shot on GoPro and edited by Jaap along the way. I had a serious spell of camera skill envy. My monotonous footage shot from the driver’s window of roads ahead, paled in comparison to the stuff these guys had! Over the next few days we had some of the most memorable times of my entire trip. Diving time! Chris called us all out with his vuvuzela and off we headed, towards the Congo. We moored near a small island a few kms off shore and to our suprise there was a whole village living on the island. The children jumped off rocks and swam out to us, happiest in the world these Tanganyika kids! Descending only a few metres, we followed Louise’s fins and cruised around massive boulders, taking in the lake’s special little cichlids. Overlanding requires constant tinkering with the vehicle, the camping gear etc. I had tightened the steering bolts and I’d noticed the tent wasn’t sitting quite straight. On closer inspection, I realised that the second section had been sitting at an angle and the hinges had been warped over time. Handy Mat helped me get the bolts undone and hammered the hinges straight. This took the better part of an hour and by the time we came back to the bar area, all we could hear was shouting and singing. We found the rest of the crew in the lake… Cath shouting for more wine, and Dave and Lesanne singing with their glasses raised high out the water. What could we do but join in? The wine flowed, the singing got louder and more passionate and the sun set on Lake Tanganyika – one of the most incredible sunsets ever. We had the most incredible meal – pig on the spit. At Lakeshore Lodge, you all eat together like one big happy family, and you drink together like long lost friends. Conversation flowed, the drinks kept coming and before we knew it Chris had brought down two enormous speakers from upstairs. Thank goodness the closest neighbours are about 10kms away – music pumped, there was dancing, there was singing, there were body shots on the bar… With Chris behind the bar, the night went downhill fast, and the evening decended into anarchy. Bring on the ‘tequila omelettes’… one times raw egg, chew, swig of chilly from the bottle, swallow and chase with a shot of tequila. We all did it. I wish never to do it again. A couple of us found ourselves in the lake (despite Louise’s warning about a resident croc, and please don’t swim after dark). Someone arrived back in the bar from the lake, soaking wet just their undies as they couldn’t find their clothes in the dark… Nights like this will be remembered for a very long time. It was 4:30am by the time before I found myself a human prop and we staggerd down the path and off to bed. Well the next morning was interesting. Lesanne and I were due to leave for Sumbawanga early in the morning and were taking Nod and Emily with us in the Beast. We only woke up after 11am and struggled with the very idea of getting packed and ready to go. Everyone was in the lounge, nursing hangovers – Dave was back on the beers… Mat and Jaap were due to get to Zambia that day, but on critical reflection decided that a short ride to Sumbawanga was tolerable, anything further would not be possible on a day like today. Time to leave these wonderful people, this magical place and move on… it was a sad goodbye to Chris, Louise, Dave and Cath. We came as guests and definitely left as friends! We got backpacks racheted down on the roof and with Nod and Emily in the back, Lesanne and I headed off up the escarpment and back to the main road that runs the length of the lake. This 150km journey took about 3 hours and was mostly on dirt. We’d agreed to meet Mat and Jaap at the Morovian Conference Centre, a christian establishment with clean double rooms and ensuite bathrooms. We decided to go out and have dinner at Forest Way, the four of us hopped in the Beast and Mat & Jaap caught a lift standing on the back bumper – just like in Africa… Still struggling from the previous night’s shenanigans, we had dinner and hit the sack early. After a slow start the following day, we said our sad farewells… Mat and Jaap were headed for Zambia and then were hoping to make a daring dash through a short strip of the Congo. Lesanne was to travel with Nod down to Zambia by bus and Emily was to wait in Sumbawanga for Nod to come back in a week or so. My compass had been set for Malawi and so I turned south east for Mbeya. Lesanne is one of the bravest young girls I have met, full of life and was such a pleasure to have on board for this stretch of the trip. She completed her trip near Christmas time and is in the process of putting together a coffee table book of her travel photos. 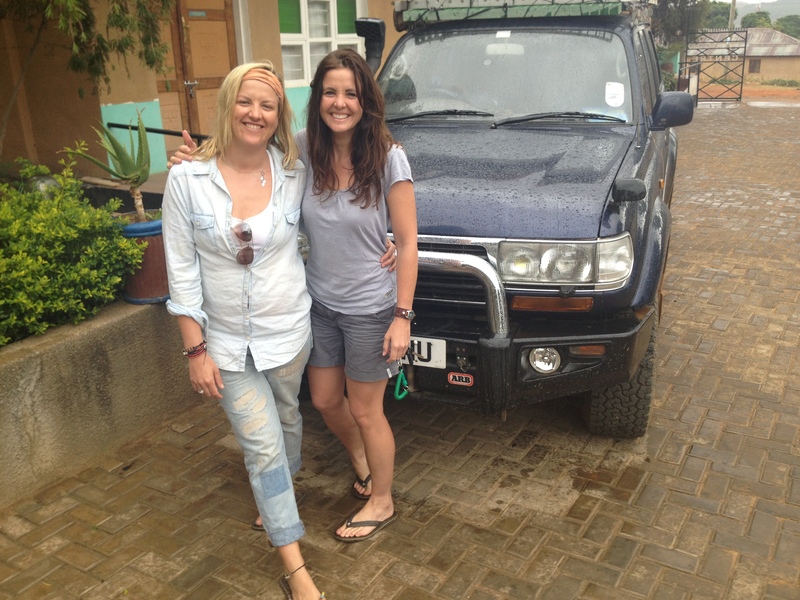 Her travel page can be found on Facebook – Lesanne’s Trip Around Africa. Saying goodbye to Lesanne before heading off in different directions. Jaap and Mat made it all the way to the Cape without too much hassle – I envy them for having ridden the length of the continent! 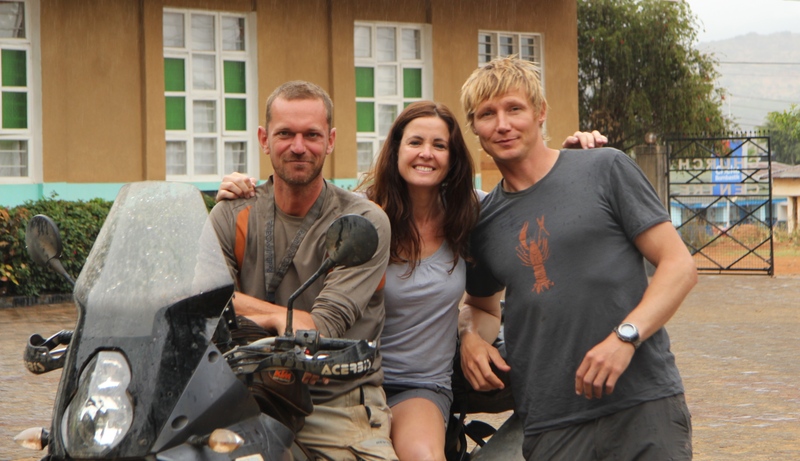 Two of the nicest gents I met on my trip, sorry to see them go… Check out their Facebook page Edinburgh to Cape Town Overland. Jaap and Mat, two of the coolest dudes I know. The drive to Mbeya was a little uneventful and took just over 6 hours. 40miles of off road next to “roadworks” ie. an almost complete new road. Then the remaining 160 miles was good tar all the way. The road takes you past the Tanzania/Zambia border in Tunduma. Abostlute chaos with trucks back to back down kilometres of road. Thank the stars I wasn’t crossing here and I pushed on to Mbeya. The scenery towards the end of the drive was pretty awesome – the road rose and fell with the undulating forested land. Garth Pereira had put me in touch with a friend from Zimbabwe, now living in Mbeya. Paul Metcalf very kindly had me stay for the night. I was treated to a night of darts and pool at the local hotel whilst the rest of the town’s volunteers played volleyball – clearly a favourite and very competitive sport round these parts. Following our little steering wheel issue up in Kipili and before heading for the border, I decided to get the Beast into a local garage and have them check that all the bolts were on tight. This took the better part of the morning but they understood my need to get going and so did me a favour by getting my vehicle first in line. With a few things tightened and adjusted, I was off to Malawi. 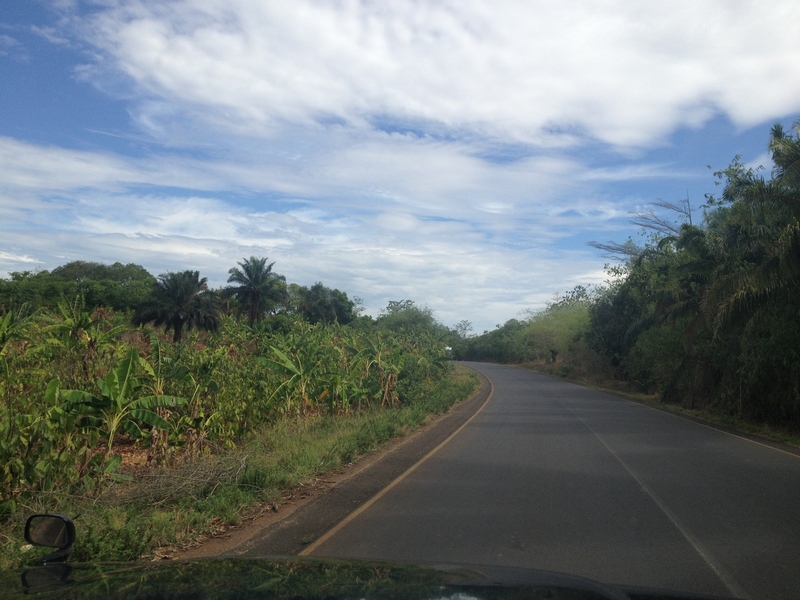 The 140km escarpment road from Mbeya to Kasumulu is one of the most stunning of the entire trip. Long winding roads rise up and then roller coast you down again on the other side past lush green forests and banana, coffee and tea plantations. This trip is slower than you think. Every time you pass a village, and there are many many villages, the speed limit decreases to 50km/h. I passed no less than 8 traffic police blocks along the way and got stopped by the 2nd one for driving 10kph over th limit. I sweet talked my way out of it, learned my lesson and just took it easy the rest of the way. They seem to have an appreciation for all things British round these parts – I drove past the “London Car Wash” and the previous day had come across the “Modern London Pub” in the middle of downtown Mbeya. The border was chaos but definitely better than Tanduma. The carnet makes customs straightforward and pretty painless, and despite the number of trucks, I was through fairly quickly. There is no charge for road/fuel tax at all, and the only fee they needed was for 3rd party insurance which I already have in the Yellow Card Comesa. Thanks Tanzania… for your shy and quiet people, for the chance of heading off into the unknown, for your unpredictability, for your picturesque woodlands and vast expanses and for the memorable times we had with the most hospitable and incredible people.